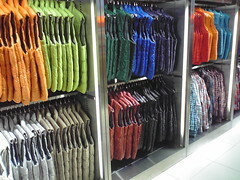 It is interesting to see these rows of vests in different colours had appeared in the UNIQLO UT store in Harajuku, Tokyo. But everything in Japan seems to be seasonal. Soon there will probably be rows of coloured winter jackets in their place. Thought, this is not just limited to clothing. It also includes things like advertising and promotions at stores. Even the menus at restaurants are very seasonal. So, if you see something that is interesting in Tokyo, photograph it or buy it now. Because, if you leave it a couple of weeks, it probably wont still be there. This entry was posted in Photos, Travel and tagged colthing, Japan, seasonal. Bookmark the permalink.